We live out in the country, so whenever I’m driving home (especially at night), I am on the lookout for deer. Sometimes they are just standing by the side of the road; other times they run across the road right in front of the car. One evening as I was coming home from work, a large buck jumped over a high fence to my right, leaped across my lane into the middle of the road, then bounded away in one more huge leap. Since then, I try to be aware of where they could be. But I never expected to find a fawn, especially in the daytime. A few summers ago, as I was heading out to pick up one of my children, I noticed the fawn in the small ditch along the side of our road. I pulled over (it’s a very quiet street) and jumped out of my car, thinking I could take a photo. I wondered just how close I could get before it ran off. Even though I couldn’t see the mother, I knew deer often leave their young in hiding while they forage, so I was confident she was around somewhere. Then I realized…the fawn couldn’t get up the small embankment to run back into the woods. Its head was turned back, as if it was looking over its shoulder, and it couldn’t seem to straighten it. It also was losing its balance as it tried to walk. I moved closer, but it couldn’t move away. I knew you should never disturb a wild animal, but I could tell something was very wrong. Normally, a fawn will either be following its mother or lying still in the grass, waiting for her to return. But it was clear this fawn was injured. It could not even take more than a couple of steps forward. We have lots of coyotes in the area, so not knowing quite else what to do, I grabbed it and picked it up. It struggled some, but it was too hurt to get away. Back at my minivan, I wondered how I was going to get it home. I was only about 1/4 mile away, but it would have taken me a long time to walk there carrying it, and I was going to be late picking up my daughter. I couldn’t figure out how to put it in the back of the van without the fawn trying to jump out, so I did the only thing I could think of — I sat down and put it in my lap. The fawn wasn’t calm, and it cried a time or two (it sounded like a lamb’s bleat). As it struggled a little, it tore some holes in my shirt with its hooves. But we made it back, and I carried it inside to our spare bathroom until I had time to figure out what to do. After I got home again, we went to work trying to find the little fawn some help. I began calling wildlife rescue groups, and we found one that could take the little deer. The rescue worker thought it had been hit by a car but was hopeful that she (it was a female) would make it. The worker said the fawn was very thirsty and had probably been hit the day before. The twisting of its neck was response to the trauma, but they gave it something that helped the muscles relax so it could straighten it out again. They would keep her until she was ready to be released into the wild. 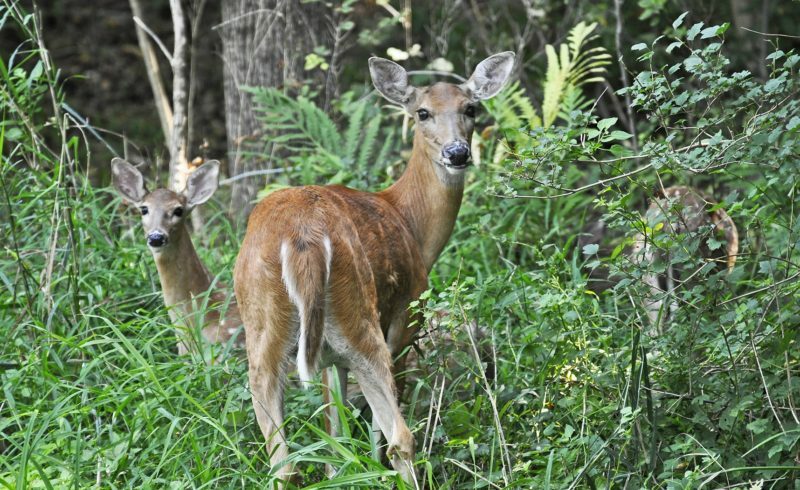 If the fawn is lying quietly in the woods, field, or even your backyard, do not disturb it. The mother is nearby, and she’ll return to it soon. If the fawn is wandering around crying, coming towards you, obviously injured, or caught by a dog, it needs your help. For more information about helping an injured fawn, visit Native Animal Rescue.